Jacqui: Will there ever be Peace and Harmony on this planet? I know you say we are moving into the 5th dimension but we still seem to be a very war like people here. I find that frustrating. The Source: (God) Indeed My Dear, I understand how you are thinking. And the human race is actually a Hybrid race. Iit has gone through genetic changes through the time that it has existed as MAN upon your planet. It was created millions of years ago … actually. But it has become through genetic changes it has become an up-standing ape-like creature – understand I did not say APE exactly – I said ape-like because the history of that creation has many influences from many life-forms that were already on your planet. And then came a time when -it has been spoken of – when the people from the Pleiades came on a Mothership to help raise the consciousness upon your planet into another dimension altogether; but unfortunately it was attacked and so the survivors had to live on Earth the best way they could. And so there was a hybrid race that was created for the starpeople that had survived at that time could barely survive on Earth and their children could not survive at all – and so their was a combination of the cells from the starpeople with the up-standing ape-like creature and so the two coming together became a LIGHT MAN a HUEMAN. Hue meaning Light. But that meant there was a raising of the consciousness in Light of the up-standing apelike creature. This has been talked about as (occurring) nearly a million years ago. The Source: (God) Now that (human body) has gone through changes again – more genetic evolvement has happened. The human has begun to evolve into a hybrid race that is loving. It is blessed with a SOUL that comes into a Human Body upon this Earth which has an agreement – the soul goes through a hierarchical body or a Karmic Body and they are overseen – there is no judgment. Each individual that comes and goes upon this Earth – actually reviews it’s own life and gains from the good points – shall we say – and perhaps regrets other decisions that were made without Universal Love. And so that is why there are still many upon this Earth who are still ready to raise a weapon to sort out a problem rather than to sit and talk with each other so that each one understands the other; and then they can compromise and begin to live with one another in Peace and Harmony. And always to help one another, for this is the agreement that was made when they first came upon this Earth. So that is happening and you could say that the point that exists now with a human is raising in consciousness – many are in Peace and only wanting Peace upon Earth. And I can tell you that the Hybrid race exists in Andromeda now – 5,000 years ahead – if you like to think about it. They have evolved – they have seen more genetic engineering within them – and they are very Happy, Peaceful, Loving Beings or they would not be able to exist in the frequency that Andromeda actually exists. The Source: (God) So is that alright now? Are there any more questions? Group: We said: No thank you; that is all well and good. Group: We were having a little confusion -about the time difference – because of feeling we were in Andromeda! The Source: (God) The Oracle that you are communicating with in your time and your place if you wish to measure it is your future. It is true. It is a future that is well ahead from what you are operating on your earth dimension. And I would say it is 5,000 years ahead. 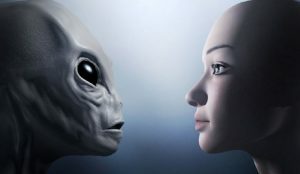 Because the life of the body – that is the hybrid of the human race that exists on Andromeda now and is very much evolved and is certainly coming from a place of Peace, harmony and goodwill. And so what would you like to know now My Dears? The Star People engaged in much experimentation and genetic engineering took place in order that the apelike creature become a LIGHT BEING and evolve to the human that is now a loving race.